After the fifth great war, you thought it was over. That the enemy was finally deflated. That the jungle was safe once more for the simian race, but then there came a popping sound accompanied by an extraordinarily inflated sense of danger. I’ve played some iteration or another of Bloons TD dating back as long as I can remember. In fact, I’ve probably played pretty much every version of Bloons there has been. When Bloons TD 5 was released on Steam a friend of mine and I promptly picked it up and enjoyed the multiplayer mode for many months. We were attempting to unlock every possible achievement but as things will happen, circumstances changed and we both got too busy to reach our goals. Bloons TD 6 was recently released on Steam which naturally prompted me to want to revisit the Bloons Universe. It currently lacks the Multiplayer component so I just might be able to get 100% achievements this time around. When first looking at Bloons TD 6 it looks like both a step up and down from Bloons TD 5 and I suppose in some ways it is both. Some of my favourite towers are absent this time around, for example, the Bloonchipper (a wood chipper that chips balloons), but that just means I have to explore the other towers a little more. This is perfectly fine with me since, as you know, variety is the spice of life, plus you never know, maybe they will add them back in at a later date. Something that is new though is that the background isn’t just there for show anymore. There are objects on the map that will obstruct the view of your towers, meaning they will be unable to target something that is within their range, but not within their line of sight. This adds a somewhat welcome new level of challenge when playing the game. Let’s talk about what exactly is going on here. Bloons TD 6 is a Tower Defense game. You build towers to prevent the enemy from reaching the exit of the map. There are a number of different types of enemies that will try to make it through your lines as well as a number of different types of towers you can stop them with. My first encounter with Tower Defense games was in the custom maps of Warcraft 3. Those were the good old days! Eventually I moved on from Warcraft 3 and started finding the Tower Defense genre taking off outside of that game. There were a number of different ones, but only a few of them really kept my attention, one of which was Bloons TD. 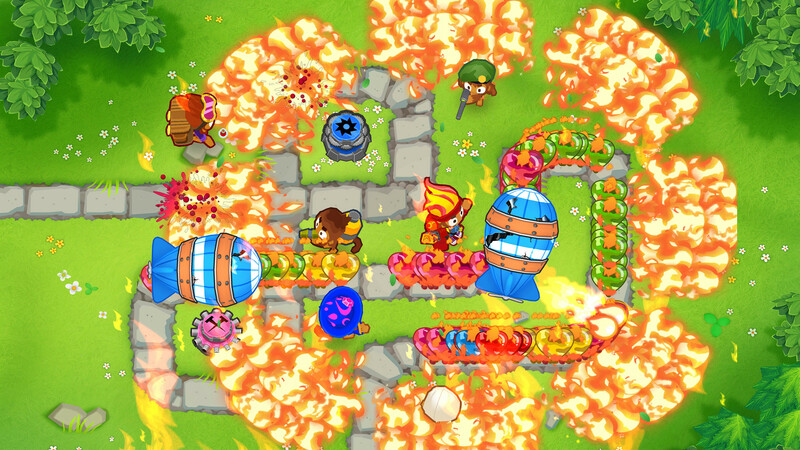 The Bloons TD series features the titular Bloons as that of the enemy of the monkeys. The Bloons come in various different forms. The basic rubber balloon typically doesn’t pose much of a challenge. They often come in layered varieties which basically means that each Bloon might need to be hit multiple times before it is ultimately popped. Besides just layering, there are also various forms of defenses the Bloons will deploy in their attempt to invade the Monkey Island. There are the camouflaged Bloons that can only be spotted by eagle-eyed monkeys, armored in metal that take heat to damage, covered in ceramic which takes more effort to pop as well as modern polymers that regenerate over time even after being popped as well as assorted other variations and combinations. If that isn’t enough, they also come in giant airships filled with Bloons that can take a lot of abuse before unloading their Bloon-filled payloads. As for the simian side, there are quite a number of units you can deploy as well. Each one fits a certain role or has a unique attack in comparison to the other towers. I won’t go into great detail on them because that would take quite some time and is likely something better suited to a Wiki than a review. I will say this though, each one has multiple skill paths. You are able to choose one primary and one secondary skill path. This allows you to have multiple of the same tower on the field, but with each of them having its own set of abilities. 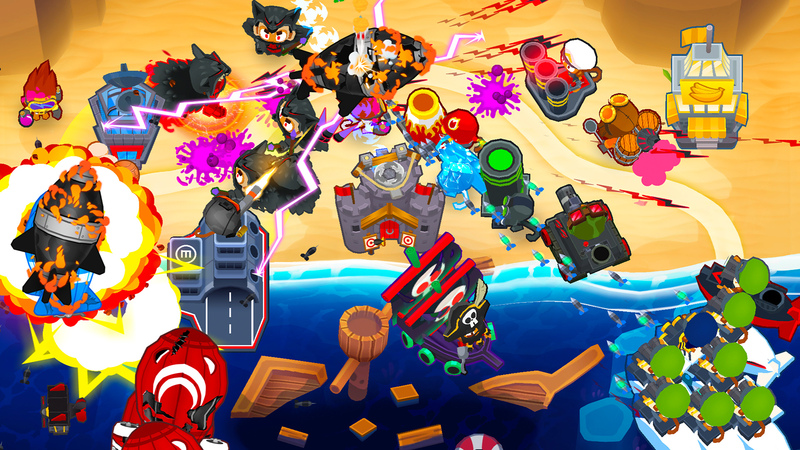 For example, Metal Bloons are a problem near the start of a map, but typically are already popped and spilt their cargo before it reaches the midpoint of the map. Now you are more in need of speed to clear out the remainder before they escape than you are of having fire attacks. So, you could build a monkey with a flame/heat based primary and build another of that same monkey further down your track that is now a multi-shot based primary rather than heat. This allows you to have a much wider variety of tower types than what it may appear at first glance. A really nice feature is the fact that each upgrade you buy for the tower changes its appearance in some way so that you can easily get to know how each tower is upgraded just by looking at it briefly. While the common towers are nice, there is an even more interesting option for you to construct, the Hero. Heroes are unique units that you can bring into play, but unlike the standard towers, you are limited to only one of them in the field at a time. You also have to choose in advance which hero you want to play with as you can’t change your hero mid-match. Each one offers fairly unique abilities, and unlike the common towers, they will upgrade themselves freely (or you can buy upgrades for them faster if you want to spend your coins on them rather than building/upgrading something else). It’s hard to choose a favourite as they each fit their own role quite well. Besides just being a super-powered tower, the hero offers heroic abilities that you can trigger when you need them. These abilities vary depending on the hero you choose and it can be quite situational which ability will be best at any given time. One thing that is a bit frustrating with the main game is the fact that even with fast forward on it can take a while to progress through the levels. It becomes even more frustrating that after you waited your way through countless waves of Bloons you end up losing nearer to the end of the level because the game threw a curve ball at you that your monkeys were just not prepared for. In earlier Bloon TD games, you could launch waves early if you felt like your towers were up for the challenge. While that feature still exists in Bloons TD 6, it appears to be isolated to just the racing mode. Hopefully one day that feature will be extended to all Bloons TD modes again. There are a few different options when it comes to playing Bloons TD 6. As mentioned, multiplayer isn’t currently available at least not in the same way it was in Bloons TD 5. Multiplayer is limited more to scoreboards than it is to actual co-op or versus gameplay. If you get tired of playing the normal maps, you can accept challenges instead. Challenges offer unique rule sets variations and come with rewards for completing them. These challenges can come in many forms such as restricting you to only certain towers or a certain number of towers, reversing a map, or otherwise messing with your strategy. These can be quite difficult so you probably shouldn’t even attempt them until you are more experienced. By more experienced, of course, I mean both you and your towers! As you use towers, they gain experience points. Once you gain enough experience you can unlock an upgrade for the tower. Once unlocked, the upgrade becomes permanently available for all future games. If you unlock something that turns out to not to be your liking, you can always just keep using the tower and gain more experience to buy something else. You will eventually unlock everything for the tower anyway so it isn’t such a big deal if you make a few missteps along the way. You, as the player, also gain experience as you play. I don’t just mean getting better at placing towers and choosing upgrades, I mean you gain experience points as well. In the early days, these levels will unlock new towers for you to use, but eventually it leads to mostly just giving you spendable skill points. 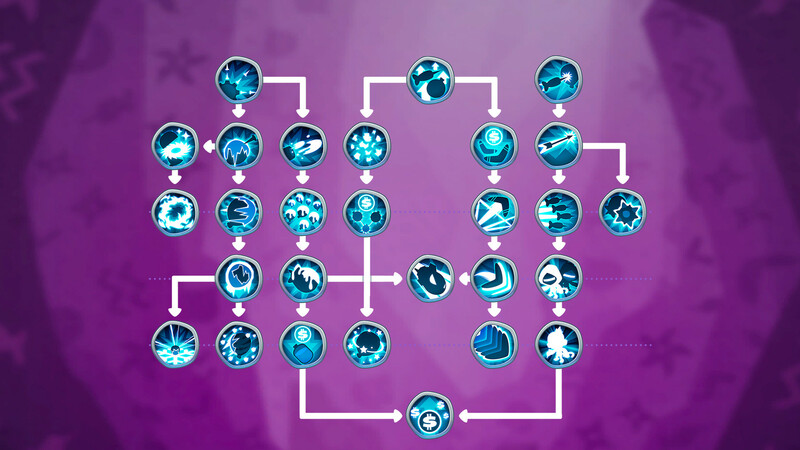 These spendable skill points can be spent in various categories to help customize and hone your towers. You can reroll if you don’t like how your upgrades are shaping up but it will cost you quite a bit of Monkey Money to do so. In this game there are two kinds of currency. 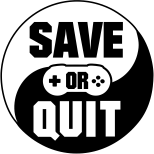 The in-level coins that stay confined to that singular play of that level and Monkey Money that is earned for completing levels or challenges. I tend to be a bit of hoarder when it comes to the Monkey Money and only spend it on things I really want/need first. For example, I saved up and bought all the heroes before I started spending the Monkey Money on Insta-Monkeys or other one-off use specials that once used are gone forever (unless you buy it again that is!). Monkey Money can be earned in game slowly, but it is also available via the in-game real money shop. The game was originally designed for mobile devices and those are nefarious for low-price or “freemium” games with almost forced in-app purchases to be able to do anything. While Bloons TD 6 doesn’t exactly force you to make any in-app purchases to progress, it really does try to make a compelling case for you to do so. You will often find yourself struggling for coins so you can upgrade your towers or build more to help prevent a leakage. To help you out, there is a one-time purchase cash shop exclusive that lets you earn double the coins forever. Those who only buy the game but not the add-on get one coin per Bloon layer popped, however, people who spend an extra $20 on top of the $10 asking price for the game get two coins. This means that the more fun and unique (and sometimes wildly expensive Tier 4 and 5) upgrades are much more attainable and usable for those willing to pay $30 for the game and more of a pipe dream for those that can’t afford to pay triple for the game. I feel like Ninja Kiwi should make this available for purchase with Monkey Money as well even if it is for an unreasonably high amount. This would still encourage purchases with real money for those who didn’t want to wait but would allow those less able to dole out more real cash to have a little more fun and advance in the game even if it took a little longer. With being a premium currency, your Monkey Money is pretty precious if you are just earning it while playing, so you need to be careful when and what you spend it on. This means you have to limit your use of Insta-Monkeys and Special abilities because using them might cost you more than you will earn for the map. But for only few dollars more than the asking price, you can buy yourself lots of good stuff! The frequent rolling sales make for even better deals! How can you lose?! Typically, that is a trick the Freemium games use to exploit their hooked players, because out of fairness, games are not free to make so the Developer deserves to earn something from it. Bloons TD 6 carries a price tag comparable to or even higher than other Tower Defense games that don’t do the real currency shop. As mentioned Bloons TD 6 started its life on mobile devices and the game is available for sale there for half the price it is on Steam. With the price being doubled for the Steam release (likely to help offset the cost of porting it), it would have been nice if they would have done away with the real money shop and just allowed you to earn everything in game. With that said, to each their own and I am sure there are plenty of people out there willing to spend money in the cash shop just to help support the on-going development of the game. I am finding myself tempted to shell out the actual $20 for the coin doubler upgrade simply because I am getting too frustrated losing constantly due to coin constraints when playing on higher level maps. Getting back to the game, the core concept is simple. Set up your towers in such a way that none of the Bloons make it from the start to the exit. There are multiple difficulty settings for each map as well as alternate versions of the maps. Typically, when increasing the difficulty, it increases the number of levels you will have to complete as well as the cost of the towers and their upgrades (making that $20 coin booster all the more needed and tempting). The rewards are also increased to make up for it but you will likely find yourself trying again a few times before finishing the map. The alternate modes add new layers of challenge for each of the levels such as limiting which towers you can use, restricting your methods of gaining coins, etc. The first time you beat any level you gain more Monkey Money than you do for subsequent completions of the same mode which makes your Monkey Money all the more precious. Graphically the game sure has come a long way since Bloons TD 1 was released over a decade ago. Back then it was a two-dimensional simple browser game without much in the way of gameplay variety. Through the years the game has evolved into a rather good looking albeit cartoonish game. The brightly coloured cartoon feel really helps enhance the visual effect for the game and I can’t imagine the game in any other art style. The costume changing monkeys help keep the game interesting as you place around your favourite towers and upgrade them to your needs. Even the backdrops for each map come in a wide variety of styles, patterns, and themes to keep the game feeling fresh as you progress through it. The sounds in the game are a little primitive but work quite well. There is some voice work being done and sound effects to help enhance the experience. The sounds are very repetitive but it wouldn’t make any sense at all if they were not. The music is also quite fitting and helps make the levels more fun to listen to rather than just having to hear the popping of the Bloons and the sound effects of your towers. Overall I believe enough effort went into the game to make it a pretty decent auditory experience. The controls in the game are very simple and straightforward to use. There is nothing complicated about this game. The monkey selection and placement couldn’t be easier and the menus are easy to navigate. The only possible gripe I could make against the user interface is that everything is a little bigger than it needs to be. Most likely due to scaling it up for a larger screen rather than the small phone screen it was intended for. If you don’t mind having to scroll down a menu rather than having it all at a glance then there really isn’t anything wrong with the UI scaling in the game. So, should you pick up Bloons TD 6? If you were a fan of Bloons TD 5 you might be a bit disappointed that some of your favourite towers are now missing and that double coins mode is now locked behind a very steep paywall rather than being provided like it was previously. Bloons TD 6 definitely feels more challenging than Bloons TD 5 but that could just be that I am rusty at Tower Defense games due to not having played one since Bloons TD 5 came out. There is enough new content in Bloons TD 6 to make it worth picking up and playing even if you have Bloons TD 5, but I think if you are new to the series and want to pick up a Bloons game, I would probably suggest you buy Bloons TD 5 instead of Bloons TD 6. Bloons TD 5 offered visual only DLC as a way to help support the game after you purchased it. I have to say I am much more receptive to that way of reaping additional cash from fans than I am by pay walling previously included features or making it harder than it needs to be to purchase consumable items and abilities. 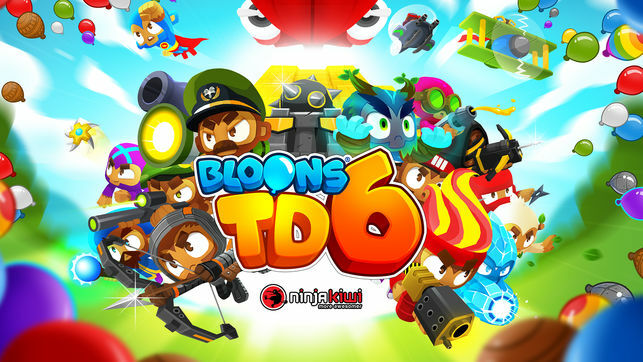 It sort of feels like Bloons TD 6 was originally intended to be like Bloons TD Battles, a freemium game that lets you play and enjoy it without any purchase, but to get the most out of the game you need to purchase the DLC and/or in-app purchases. Ignoring the contention about the high priced in-app purchases and the pay-to-win feel I got from the game, Bloons TD 6 is more refined than Bloons TD 5 was in terms of map terrain and I have to say it is a welcome change to the formula. 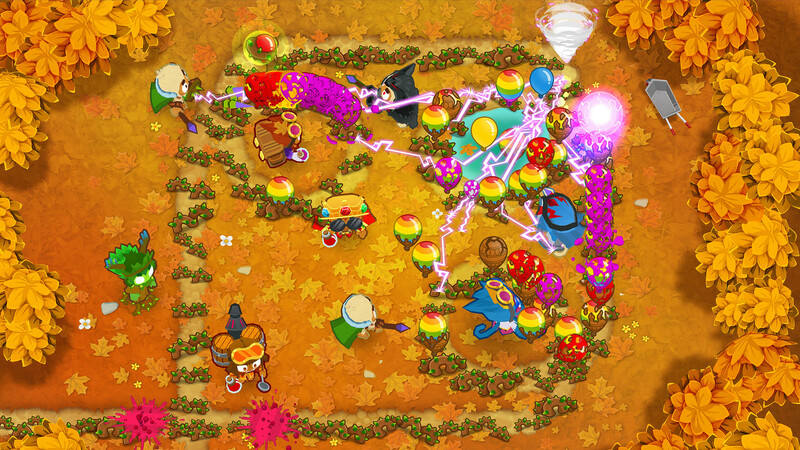 While Bloons TD 5 did have tunnels, it never really had anything else that could impede your ability to hit in-range Bloons. Having debris and other things getting in your way adds an extra layer of strategy to your tower placement. 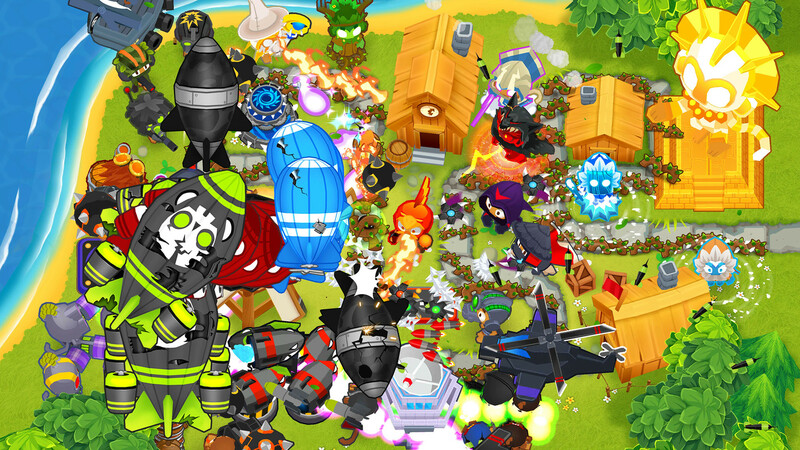 Even with the Engineer, Bloonchiper and other tower being missing, Bloons TD 6 offers enough towers and variations on those towers to keep you quite busy planning out how you are going to build and tailor your ultimate defense against the Bloons. I have enjoyed my time with Bloons TD 6 so far and intend to keep playing but it doesn’t have the same draw and pull for me to gravitate towards that Bloons TD 5 had for me. All in all, when it comes to Bloons TD 6, I think I would have to say, save it for later.